You may be able to digitally scan your old photographs yourself and restore many shortcomings using such free programs as Google Picasa. You may find online tutorials and software to help you when restoring old photos but, for the best results you should consider calling in experts like us. 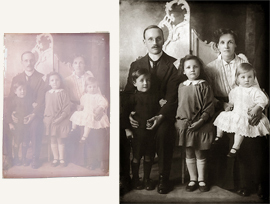 Look out your old photos, historic photographs, family photographs, faded photographs, torn photographs, creased photographs, photographs that need repairing, photographs that need restoring and get your photographs restored now.